I was born and grew up in the Wildschönau Valley, home now to my newly opened Wildschönau Mountainbike School. Mountainbiking has fascinated me from an early age and I started riding in my teens. For 16 winters and two summers I worked as a ski instructor, trainer and mountainbike guide in Sun Valley/Idaho. I started working as a mountainbike guide with clients from my ski classes, accompanying them on tours throughout the Rocky Mountains. I was hooked! For six summers I worked as a bike gide, technician and rep on the cruise ship Aida. During this time I guided in a total of 45 countries. 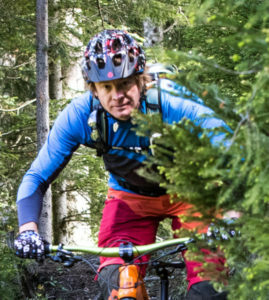 This invaluable experience led to a coveted position as guide and technique trainer at Kurt Exenberger’s Kirchberg Bike Academy – the first and most famous school in Austria, where I have been employed for the last six years. I learned a great deal there about technique and how important it is in this sport. The time has come now for me to pass on all my experience and knowledge to students of my own school in my hometown. My aim is to show my clients the beautiful trails, remote places and many cool trails in our breathtaking Wildschönau region, an insider tip within the mountain biking community.